I am astonished that I, Eco Girl, have such a bad glass and cup habit. Seriously, on a weekend I use at least two cups a day and three or more glasses. That is ridiculous. We’ve been home for three days this holiday weekend and I’ve run at least three loads of dishes. Brad had it right – rinse and re-use. 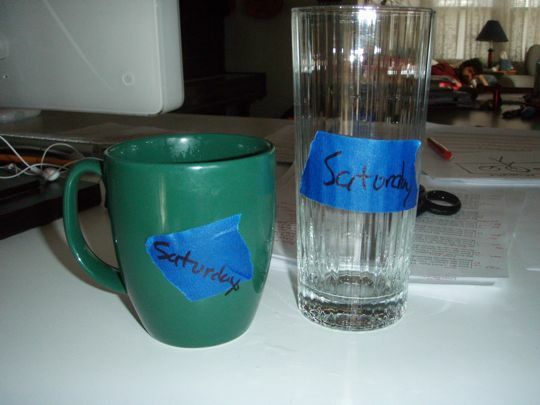 Today I tried an experiment, and labeled my cup and glass with tape. You can see how the ‘y’ is partially marked on the cup in permanent marker, so that was a really, really good plan. So, will it be possible for me to do this without the help of tape tomorrow? Do other people use new cups for new drinks, or are you better about reusing? I use the same glass for a week at a time. In my case, it’s not eco-friendliness, it’s laziness. Good luck with that permanent marker. Dry Erase Marker takes off “permanent” marker. The low odor aren’t as good as regular. Hmmm, I think I need coffee, and a lot of it… Sorry for the typos. Good: I (my family) use a different cup with each new drink. Bad: Because there aren’t enough cups in the world for this, especially when the kids have friends over…I keep a stack of paper cups on my counter next to my frig. Sorry Lauren…can you figive me? It’s the only way I can survive. I see that Lloyd is catching up on his sleep. I, and my children like me, will unwittingly use every single freakin’ glass in the house by the end of the day. I’m right there with ya! Dan and I use every glass in the house, constantly. With me, it’s because I am a germophobe. I don’t know what Dan’s excuse is. When the older kids are here, it’s even worse. With them, it’s laziness and a desire to make me crazy (by breaking my glasses).